Not only when having lived in the Middle East a couple of years ago, then interested in how beginning and end of Ramadan was actually determined, I have always been a moonwatcher. I remember vividly my first lunar eclipse when at the tender age of 6 or 7. My late father had woken me up and showed and explained the event. When having moved beyond the Arctic circle in 2007, I noticed the phenomenon of one or two full moons in the months November, December and January which won’t set but circulate, in big waves, above the horizon. A small compensation for the long and dark winter when sun won’t rise at all. It was amazing that not every local was aware of a circulating full moon. Tromsø is surrounded by several up to and more than one thousand meters high mountains, and when the full moon is close to the jagged horizon, in warmer colors due to borrowed sun light refraction in the denser atmosphere, the human eye perceives it huge. Much huger than when it is in the zenith in cold clear winter nights. It can easily be shown that the different size of the moon when it is close to the horizon or up in the sky is just an illusion, the moon illusion. The moon’s angular size is the same. There seem to be two contradictory explanations for the moon illusion, the apparent distance and the perceived distance theories. The latter, older theory, holds that a moon close to the horizon is perceived farer away than a moon in the zenith, therefore its size is perceived larger when close to the horizon. An often reproduced picture has illustrated this perception of a flattened sky dome. A moon close to the horizon is thus perceived farther away and thus appears larger than a moon up in he sky which is perceived closer. Recent theories postulate in contrast that the perceived size of the moon is the dominant cue to its distance. 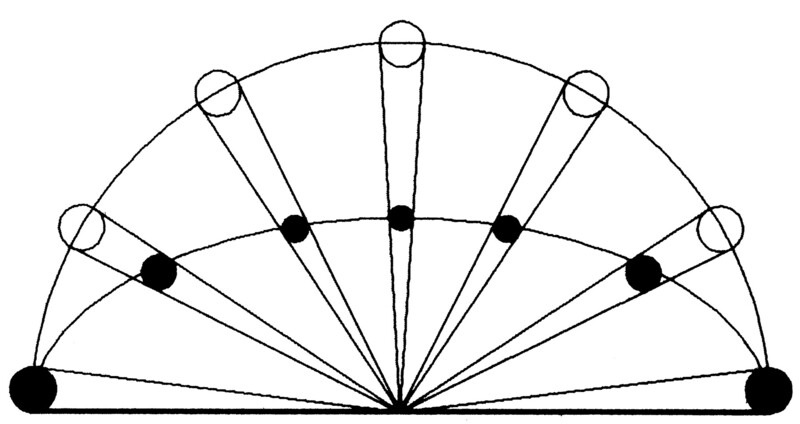 A moon close to the horizon is thus perceived closer (larger) than in the zenith (farther). This is of course the opposite of the apparent distance theory. Furthermore, the accommodation of the eyes increases while viewing the elevated moon. It is proposed that this leads to a reduction in the perceived size of the moon. See for discussion and some experiments which apparently prove the apparent distance theory here  Check, for example, the stereogram above by staring at a point some distance behind the page. While Alhazen has understood that the moon illusion is a psychological problem he favors the idea that a moon close to the horizon is perceived farther away. But while the moon illusion applies to the sun (which cannot be observed when in the zenith) and, as Alhazen notes, to the distance of stars and the size of star constellations, huge objects at the horizon such as mountains are perceived much larger than they are in reality, as well; as can easily be seen, for instance, on photographs. 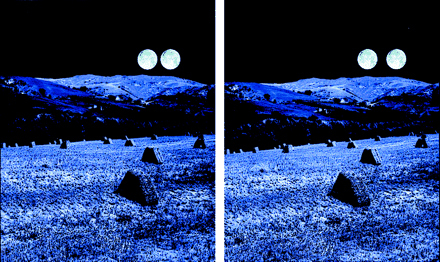 So, the moon illusion applies to all objects close to the horizon. Our perception of the world outside is a close one, small and homelike. See, for instance images of my landmark mountain, Blumannen. On a not magnified picture (left), mountains seem to be small and far away (in fact some 22 km). What is perceived when looking at the mountain is rather the right image. Kaufman L, Kaufman JH. Explaining the moon illusion. PNAS 2000; 97(1) 500-505. Sabra AI. Psychology versus mathematics: Ptolemy and Alhazen on the ‘Moon Illusion’. In: Grant E, Murdoch JE (eds.) Mathematics and Its Application to Science and Natural Philosophy in the Middle Ages: Essays in Honor of Marshall Clagett, Cambrige University Press, Cambridge: 1987, p. 241. 19 January 2014 @ 7:20 pm. This entry was posted in Uncategorized and tagged Alhazen, Ibn al-Haytham, moon illusion. Bookmark the permalink.